4", 5", 6", 7", 8", 9", 10", 11", 12"
Most metal slip over caps for fence and deck posts have a thin edge that barely hangs over the side, which can allow water to seep underneath the post cap and rot your fence post from the top down. That kind of water damage is literally the fastest way to destroy your fence investment and cost you money. Post Cap Depot Copper Fence Post Caps provide the longest slip over edge of any copper product on the market. The thicker edge provides better protection and a more stylish appearance as the solid one piece construction enhances the look of any fence or deck investment. 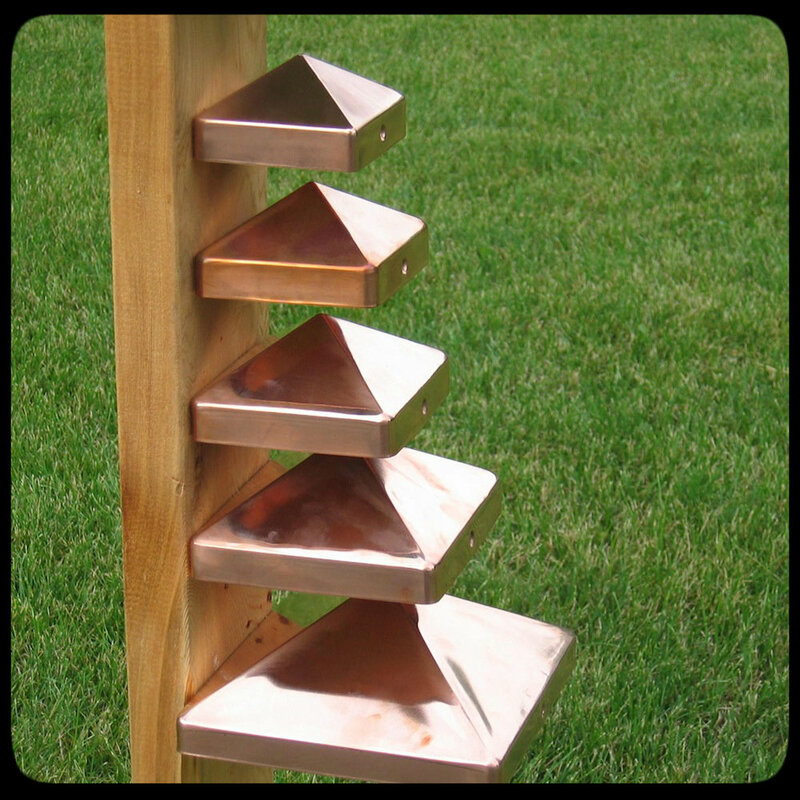 Each copper cap is supplied with 2 copper plated screws for easy mounting (except round nautical post caps). They are available to fit post sizes from 4x4 to 8x8 (including some full size posts). The copper will patina to a green color over time to give a stately antique look. If you want to retain the polished look simply spray the copper post cap with a clear lacquer outdoor spray. These copper post caps will last a lifetime with absolutely no maintenance. We want to make sure you are satisfied with your products which is why we Guarantee For Life that our post caps will never split at the corners. If you're a fence installer and you want to offer lifetime satisfaction to your customers, go right ahead! We'll back you every step of the way with our proven methods of fence post protection. Watch and see how long these copper post caps last, even through wind, rain, hail, sleet, and snow. They'll last so long you'll forget you ever bought them! Ask about our incentives for repeat customers and leaving customer reviews!